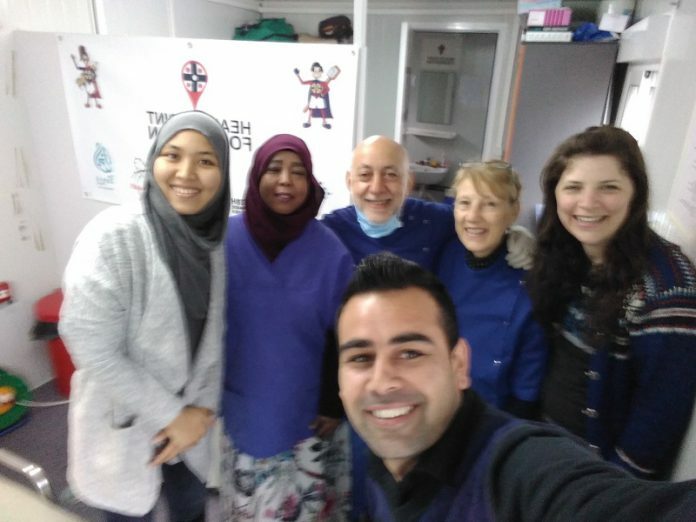 I have been reporting on my visits to Greece to provide emergency dental treatment for the many refugees in camps there for Rye News since my first visit in the summer of 2016. I have just returned from my seventh trip and this is the first of three articles on my experiences. On the first five visits we were based in Thessaloniki in the north of Greece and travelled from there to set up a temporary clinic in whatever space could be allocated to us at the camp we were assigned to for that day. We took all the necessary equipment with us and had to set up in venues as varied as a tent, a semi-derelict former psychiatric hospital, a disused toilet paper factory and a hotel bedroom. The last two trips have been to the island of Lesbos which is only about four miles off the coast of Turkey and as such the initial point at which many refugees reach Europe having paid smugglers to provide a space in a very overloaded dinghy. There is a camp near to the village of Moria sited in a former army camp but it has become so large that it has spilled over into a tented settlement in the surrounding olive groves. It was to a clinic in a portacabin in Moria camp that we headed each morning on the bus from the town of Mytilene where we were based. The clinic was in a compound guarded by a double wire fence topped with barbed wire and with a guard at the gate. It was a relief not to have to set up a clinic each day and as on previous trips I used a unit which had been partially funded by donations from Rye residents. Diana, my wife, came with me to assist as she has done six times. We were last in Moria camp in June 2018 when it housed possibly as many as ten thousand people although it was only designed for two thousand. It was a truly terrible place with a palpable air of menace and despair. On this trip we found that there were improvements, the number of residents is now four to five thousand (it can be hard to get accurate figures) with more services provided by a variety of non-governmental organisations (NGOs). The dental clinic in Moria camp is run by an NGO called Health Point Foundation (HPF). It is a small organisation and all those involved with its work are self-funded volunteers. HPF does sterling work providing a vital service, however there is a far greater need than HPF can currently satisfy. The camp was less depressing than when we were last there though it is still not a pleasant place to be especially on a long term basis. 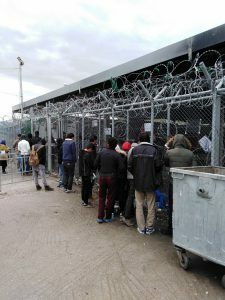 Thousands of Moria camp residents were moved from Lesbos to northern Greece and the camps around Thessaloniki so again there are many refugees living in the north of Greece and there is no dental service for them. In addition there are thousands of refugees on the island of Samos, which is only one mile off the coast of Turkey, living in pretty makeshift conditions with very few services and no emergency dental provision. We found that the translation needs of the clinic had changed from our last visit though not the dental needs. On this occasion we discovered that 80% of the camp are Dhari or Farsi speakers meaning that they are from Afghanistan or Iran. We saw one Arabic speaker, one Somalian speaker, a couple of French speakers but all the rest were Dhari or Farsi, languages which are very similar but have some vocabulary and pronunciation differences. Next week Kyriacos writes about some of his individual cases.